Window World®, headquartered in North Wilkesboro, N.C., is America’s largest replacement window and home remodeling company with more than 200 locally owned and operated offices nationwide. Founded in 1995, the company sells and installs windows, siding, doors and other exterior products. 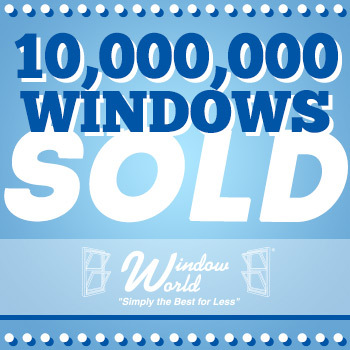 To date, Window World has sold over 10 million windows. For the second consecutive year, Window World ranked “Highest in Customer Satisfaction with Windows and Doors” by J.D. Power. Window World is an ENERGY STAR® partner and its window products have earned the Good Housekeeping Seal for seven consecutive years. Additionally, through its charitable foundation Window World Cares®, the Window World family provides funding for St. Jude Children’s Research Hospital®, where it was named New Corporate Partner of the Year in 2010. Since its inception in 2008, the foundation has raised over $4.5 million for St. Jude. Window World, Inc. also supports the Veterans Airlift Command, a non-profit organization that facilitates free air transportation to wounded veterans and their families.